The Assi Ghat is a series of steps that leads down to point where the holy Ganges River converge with the Assi River. A typical feature in most Asian countries, where temples are strategically located near a body of water, this ghat can be found in the southernmost part of the old city of Varanasi. It is also one of the most traveled holy places connected to the worship of the Hindi god, Shiva. The Assi Ghat can accommodate around 22,000 people all at once, as approximately 300 people visit these sacred steps every hour on an ordinary morning. More people can be seen during festivals and various entertainment events. Reports show that thousands of people visit this site every year, especially during the Maha Shivrati, one of the most important Hindu festivals celebrated annually every February or March. As thousands of pilgrims visit during Magh (January-February) and the Chaitya (March-April), the place is like a kaleidoscope of various colors with women’s saris as they bathe or take a dip in the river. The Probodhoni Ekadashi, Dussehra, Makar Shankranti, and solar and lunar eclipses are celebrated here as well. Its close proximity to numerous temples and places of worship makes it a hub for devotees, pilgrims, and tourists. It is said that taking a dip into the holy waters of the Ganges can bring punya (merit) and absolve a person of all his or her sins. That is why Assi Ghat is sometimes called Assi Saimbeda Tirtha. Like with most tourists and pilgrims, visiting holy places can bring a sense of peace and harmony, making the Assi Ghat not just any other set of steps, but also a place of contemplation and meditation. This remarkable attribute made it a subject of Bollywood director Chandra Prakesh Dwivedi’s 2011 film Mohalla Assi, which stars Sunny Deol – the Action King of Bollywood. Holy places are sometimes associated with legends and myths. References to the ghat are found in early literature such as Padma Purana, Agni Purana, Kurma Purana, and so on. One legend tells of the Hindu goddess Durga throwing her sword after killing the demon Shumbha-Nashumbha, resulting in the creation of a big stream now called the Assi River. The great Indian poet saint, Goswami Tulsidas, sometimes referred to as Tulsi, was said to have written the Shri Ramcharitmanas here. This epic poem chronicles the deeds of Lord Rama and narrates the events of the Ramayana, centered on Lord Rama’s heroism. The Ramlila, which is a story based on the Ramayana is said to have been staged here for the first time. Other musical shows are also performed at the ghat, which are mostly dedicated to the deities. In order to greatly enjoy the place, tourists and visitors can either hire a boat or go on the Ganges tour cruise to see the different ghats and temples surrounding the Ganges River and Assi River. The Assi Ghat is in the southernmost end and is hard to miss, since it has a lingam or representation of Lord Shiva with offered flowers floating around it. 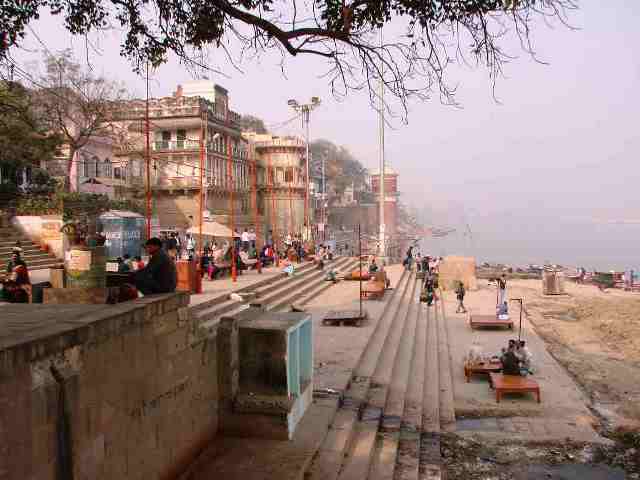 It is also located near the Mana Mandir Ghat.